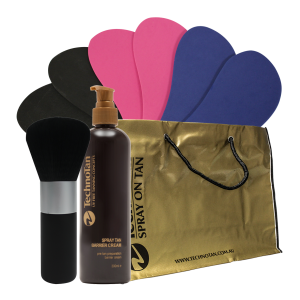 Supporting TechnoTan’s extensive range of spray tan solutions is a selection of compressors, application guns, spray tan tents, booths, pods and tanning accessories. We also offer a range of services to support your spray tanning business such as: marketing support and training. With over 430 spray tan products for sale, TechnoTan guarantees to have almost anything you will ever need for your spray tan or beauty salon. TechnoTan have developed a range of unique blends in 15 shades, to suit all skin types. All of TechnoTan’s tanning solutions are created using the finest naturally derived botanical and certified organic ingredients. Kickstart your spray tan business by investing in a Spray Tan Package. In addition to saving money, these packages give you all the necessary products required to run an effective spray tan service. TechnoTan can satisfy all equipment needs. We supply compressors, spray tan guns, pop up booths and spray tanning pods. Present a professional look by wearing uniform TechnoTan branded shirts. Create awareness and market your salon by utilising signage. Draw in more customers through print materials to provide visual excitement! TechnoTan has a range of materials which includes A-Frames, X-Frames, Tear Drop Banners, car and window signs. TechnoTan is a renowned leader in the Spray Tan sector, not only for producing high quality products, but for our first-class spray tan training. Knowledge about the correct technique for spray tan applications, will have clients leaving your salon looking fabulous every time. Consistency is key; it can encourage positive hype and repeat participation.